I wasn’t always the Chief Frugalista. When I took my first trip to Europe in 1987 I went Economy (Coach) with an enormous suitcase, and at least four pairs of shoes. I was too frightened to go it alone, so I went on a guided tour, and got taken to all the tourist cliches. I did the same thing three times in five years……. Then in 2000 Mr frugalfirstclass and I took our first trip to Europe as a couple. Because we were renting a car my enormous suitcase wasn't going to work. So I took less. We travelled around under our own steam, avoided the long queues with our National Trust passes in the UK and stayed in the most fabulous mansions under a Bed & Breakfast scheme I found. We spent less money, we had more fun and we saw and did more. I knew I was onto something - pack less, pay less, see more. My blue print for frugal first class travel was born. This all Business Class airfare to Europe cost the same as my first Economy flight in 1987 – I’ll show you how easy it is to do! Over the years I refined my packing, my itinerary planning and my ability to hunt down authentic experiences at a budget price. In 1987 I paid $8000 for my flights and trip to Europe. Now I fly Business (and sometimes First Class) and spend far less. I pay less and travel more. I want you to do the same. I want you to dream of the trip of a lifetime. I’ll show you how to plan it. My packing lists (complete with my real life photos from my own real wardrobe – no Polyvore here!) will show you how to travel with one tiny carry on bag and have an endless supply of outfits to suit any occasion. You’ll gain the skills and expertise to plan that trip of a lifetime. I’ll show you my real examples of how I actually search, book and pay for my actual itineraries. Then I’ll show you the most wonderful destinations Europe has to offer – complete with history, architecture, and of course delicious local food and drink. You may be on a frugal budget, but you will definitely be travelling first class. 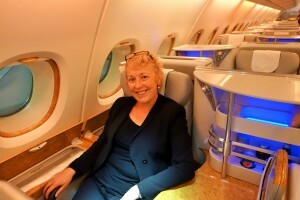 As I say at frugal first class travel…..
Dream. Plan. Pack. Travel. Repeat. Isn’t that the way you deserve to travel? Your frugal travel site is very helpful indeed! Hi, Enjoy your blog. My dream is to go to Europe from the US. however the thought of being on a plane for that long gives me anxiety. I think if I could go at least in business class would be doable. I can’t read or watch a movie, get motion sickness easy. I generally sleep as much as I can on the flight. How did you find airfare that you could afford when you started? I’m not a big shopper when I travel nor do I like to spend a lot of money on food. I love to travel for the experience and the adventure. Hi Jane, I think you will find the intercontinental flights more comfortable for your motion sickness as they tend to be much bigger planes and therefore more stable. I would check out Skyscanner for flight comparisons for cheap options. The other cheap Business Class option is to sign up for the American Airlines loyalty program. Once you have been a member for a month, you can buy mileage points at a discounted rate. You can then use those points to book a Business Class seat on One World airlines. What I would recommend is checking that there are seats available, THEN buy your points when you are ready to book. For us in Australia, I can buy enough points for a return flight to Europe for just over half price (depending on the exchange rate).